By this time last year, 26 percent of the country's corn crop was already planted. A wet, cold spring means that only 4 percent is in the ground right now. 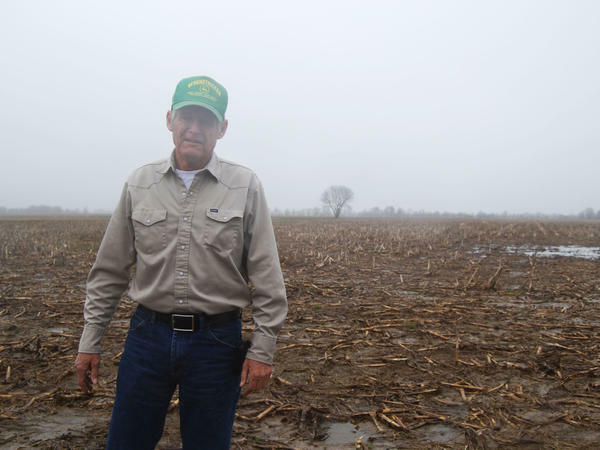 Missouri farmer Gary Riedel says wet weather will put him about a month behind last year's planting. Last year's drought wreaked havoc on farmers' fields in much of the Midwest, cutting crop yields and forcing livestock producers to cull their herds. This spring, the rain that farmers needed so badly in 2012 has finally returned. But maybe too much, and at the wrong time. It's almost the end of April, which is prime time to plant corn. But farmers need a break in the rain so they can get this year's crops in the ground and try to lock in good yields at harvest. "There are other things that can limit yield, and planting date isn't necessarily even the most important one," says University of Missouri agronomist Brent Myers. "But it is something we have to consider. And we want to try to get that corn planted in that timely window of, say, after the first week of April to the first week in May." At his farm in Centralia, Mo., Gary Riedel, 69, in his green baseball cap and Western-style shirt, is just itching to plant corn on 1,000 acres of his 2,300-acre farm. He pulls open the lid from one of his planter's hoppers and shows me the salmon-colored corn seed that's all ready to go. "Last year, I believe I started planting on the 28th of March, and this year, it may be the 28th of April, the way it's beginning to look," Riedel says. "It's just that the later we get, the more we are subject to problems from pollination due to hot weather." Excessive heat and dryness can hurt corn pollination and stunt growth, leading to lower yields. So farmers try to plant early — especially with corn still getting about $6.50 a bushel. (As The Salt reported last year, corn farmers made serious money, even though yields were down.) The U.S. Department of Agriculture says by this time last year, 26 percent of the country's corn crop was already planted. This year, farmers only have 4 percent of their corn in the ground. We walk out to one of his misty fields, and Riedel points to the reason. "See there, you can see a water puddle out in the field," he says. "We're going to have to wait till that dries up." But even when the puddle dries, it still might take a while to get corn into the ground. Planting in cold, wet soil can cause all kinds of problems for corn seedlings, including that they can't take root or emerge above ground. 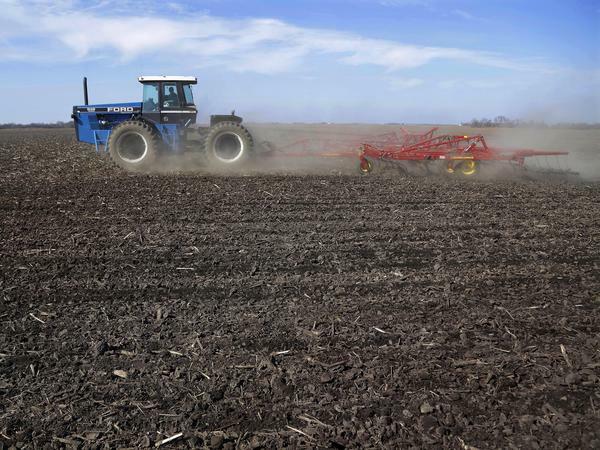 "We need some period of dry weather to help dry up the soil so producers can get out in the fields," says climatologist Pat Guinan, who has been forecasting the weather in Missouri for a quarter century. "Perhaps there may be some drier conditions, which will help. But right now, things are a little too wet across a good part of the state. And not only Missouri. Much of the Corn Belt is very wet. Especially from Iowa, over into Minnesota, parts of Wisconsin, Illinois and on into Indiana, we have some very wet conditions." But even up until January, this moisture is what farmers had been hoping for. Last year's drought led to a 13 percent drop in corn production, which in turn led to tight corn stocks and increased competition for corn between ethanol plants and livestock producers. The shortfall is also hurting corn exports, which are now at a 40-year low. "A good production year would mean there would be less competition and would improve margins," says Sterling Liddell, an agricultural economist with Rabo AgriFinance. "Especially in the cattle industry, which has suffered the most." Last year's drought moved many farmers, including Gary Riedel, to increase the amount of crop insurance they carry. Peggy Smart, 77, also upped her coverage. Along with her family, she plants corn, soybeans and wheat on 6,000 acres of Missouri River bottomland in Tebbetts, Mo. But nothing is planted yet. "We just don't have enough sunshine," she says. Both Smart and Riedel are hoping to minimize the risks of bad weather by trying out drought- and flood-tolerant hybrid seeds this year. But first, they have to wait for the soil to dry out. "It's just crazy that one year is one way and one is another," she says. "We don't have to go to Las Vegas to gamble, because farming is the biggest gamble there is." Last year's drought devastated Midwestern farms. This spring, heavy rains arrived but the timing is not great, as Abbie Fentress Swanson reports from Columbia, Missouri. PAT GUINAN: Missouri Climate Center; this is Pat. ABBIE FENTRESS SWANSON, BYLINE: Climatologist Pat Guinan has been forecasting the weather in Missouri for a quarter century. So it's no surprise that his phone rang off the hook last year as the drought gripped the region. Now he's fielding calls about rain, which you can hear as it plunks down outside his office window. Guinan hangs up the phone and checks out the forecast. SWANSON: What are you looking at there? GUINAN: It's like a forecast of how much precipitation they're expecting to fall over the next seven days, and this is the three-inch contour, which pretty much covers a lot of Wisconsin, Illinois, Southeast Iowa, you know, the Corn Belt. SWANSON: In case you didn't catch that, the three-inch contour means more rain is coming. Lots of it. GUINAN: And so planting is going to be delayed big-time if this verifies, according to - and we're already, you know, really wet here right now. SWANSON: Yes, you heard that right: much of the Corn Belt is having a really wet spring. Earlier this year, this moisture provided much-needed relief to one of the most brutal droughts in decades. Now farmers are hoping for a break from the rain so they can plant corn during a short window of time that will produce maximum yields. BRENT MYERS: There are other things that can limit yield and planting date isn't necessarily even the most important one. SWANSON: That's University of Missouri agronomist Brent Myers. MYERS: But it's something we have to consider. And we want to try to get the corn planted in that timely window of, say, after the first week of April to the first week of May. SWANSON: That's what Missouri farmer Gary Riedel is hoping for - especially with corn still getting about $6.50 a bushel. Wearing a green baseball cap and western-style shirt, he thrusts a hand into one of his planter's hoppers and grabs some salmon-colored corn seed he's itching to plant. GARY RIEDEL: Last year, I believe I started planting on the 28th of March and this year it may be the 28th of April the way it's beginning to look. SWANSON: Excessive heat and dryness can hurt corn pollination and stunt growth, leading to lower yields. So farmers try to plant early. The USDA says by this time last year, 26 percent of the country's corn crop was already planted. This year, farmers only have 4 percent of their corn in the ground. In one of his fields, Riedel is pointing to the reason. RIEDEL: See there, you can see a water puddle out in the field. We're going to have to wait, wait till that dries up. SWANSON: Planting in cold, wet soil can cause all kinds of problems for corn seedlings. But even up until January, this moisture is what farmers had been hoping for. Last year's drought led to a 13 percent drop in corn production. Meaning, tight corn stocks and increased competition for corn between ethanol plants and livestock producers. Agriculture economist Sterling Liddell says the shortfall's also hurting corn exports, which are now at a 40-year low. STERLING LIDDELL: A good production year would mean that there will be less competition and would improve margins, especially in the cattle industry, which has suffered the most. SWANSON: Last year's drought moved Riedel to buy crop insurance for all of his 2,300 acres. Seventy-seven-year-old farmer Peggy Smart also upped her coverage. Along with her family, she plants corn, soybeans and wheat on 6,000 acres of Missouri River bottomland. PEGGY SMART: It's just crazy, you know, that one year is one way and one is another. So, and as I said, we don't have to go to Las Vegas to gamble because farming is the biggest gamble there is. SWANSON: Both Smart and Riedel are hoping to minimize the risks of bad weather by trying out drought and flood-tolerant hybrid seeds this year. But first they have to wait for the soil to dry out. For NPR News, I'm Abbie Fentress Swanson in Columbia, Missouri. INSKEEP: And that story came to us from Harvest Public Media, a public radio reporting project that focuses on agriculture and food production issues. Transcript provided by NPR, Copyright NPR.